WEST HARTFORD, CT- The Albany Great Danes traveled up to Hartford to take on the Hawks. At 4-0 in the America East and with a resume of victories over numerous teams out of conference it was clear the Great Danes would be a tough opponent and they did take the match in 3 sets. However after a relatively quick 25-15 set 1 win the the Danes had a tougher fight to a 25-17 win in set 2. Set 3 found the Hawks in the lead a few times and ended with a narrow 25-22 win. In set 1, Albany pulled out to an 8-2 lead and turned that into 15-8, and then 20-11, making a comeback difficult. Hartford would actually nearly trade point for point after that but it was too late to stave off the set loss. 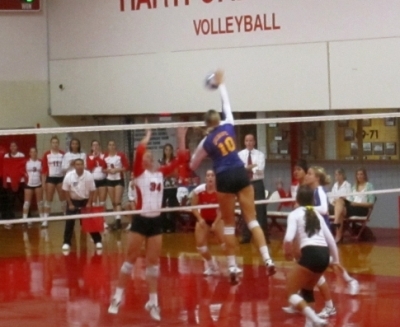 Offense for the Great Danes included an early kill from Traci Vandegrift, Gabby Whitworth got in on the scoring, and soon afterward tapped the ball over the front line, Vandegrift next hammered the ball in later, Casey Wright picked up a kill and not look after another, and another after that, Samantha Brostrom also had a kill early on, later Vandegrift added another kill off the defenders out of play. Much later Dunja Prgomet and Wright shared a block, and Wright and Brooke Stanley then shared one as well. Wright would end the set with a kill. Offense for the Hawks composed in part of a kill from Lindsay Anderson, later Kami Nethersole added a spike, her sister Sareeta launched a rocket and then had a block right afterward, later Michelle Cordell took a set from Jackie Tamburri and sent it cross court. Nethersole added a put down, and Tamburri used her fake set attack successfully. Later Sareeta Nethersole had a cross court kill and Dionna Kirton got in on the spikes landing one just in bounds. In Set 2, each side went back and forth until Albany started building a lead. Hartford would give chase and would pull within 3, but that was as close as they would get. Albany’s offense included another kill from Prgomet, Wright struck early and often with multiple kills and a block, Brostrom crushed the ball over the net and on an ensuing point used finesse as well for points, she would later end a Hartford run with a swinging whap. Towards the end of the set, Wright caught fire, she had a block, then a kill to the corner, than a kill off a Hawk onto the scorers table. Prgomet set the ball to the back of the U of H zone for another point, Wright then pounced on an overpass, and ended the set with a tap attack. This was interrupted by just a few Hartford points. Hartford scoring included a kill from Cordell to start the set, Kami Nethersole struck again, Sareeta added a kill of her own, Taylor McCreery picked up a kill as did Sareeta again. After a string of Albany points, Cordell had another whap, Kirton served up an ace, and Tamburri and Cordell teamed up on a block, before Kami Nethersole had another pair of kills Later Sareeta Nethersole and Kirton would also pick up kills. The much closer set 3 opened with Hartford pulling out to a lead only to have Albany storm back, but Hartford then pulled out again only to have the Danes climb back in and build a lead of their own as the Hawks pursued. Hartford had the advantage at the 11-9 mark but it was soon 21-17 Albany, still the red and white held on to get within 2 late, but the visitors ended it. For the Great Danes, Brostrom had an early kill, and Prgomet added to her totals with three of varying velocities, Brostrom used a light touch to pull her team within and Stanley tied it when her serve hit the net and rolled dropped in to the U of H zone. Vandegrift than grabbed the lead smashing the ball of the block attempt. Stanley added another service ace to continue to build the lead the Vandegrift had two tap attacks. Wright got back in on the scoring with a kill that hit the floor despite attempts to dive after it. Prgomet teed up a hug kill, and later Stanley had a block, and Brostrom whack another over. Stanley picked up a kill, and Brostrom uncorked a missile, followed by another kill,. Stanley would end the set with her own spike in. For the Hawks, offense came from Kami Nethersole, a block from Lindsay Anderson, another fake set from Tamburri, two kills from Cordell and a tandem block with her and Kami Nethersole. Each Nethersole would have two more in the middle of the set, and Cordell had a pair of kills including one where the D tried to return it but the ball hit a girder and smashed into the floor. Kami Nethersole added two more kills to cut the deficit to 2, and Anderson whacked down an errant Albany pass late for Hartford’s last point. Both liberos, Danielle Etta for Hartford and Laurie Gonzalez for Albany had plenty of opportunities to make some great defensive saves. Gonzalez had a ton of dives to keep things going and Etta ended up in her own bench at one point knocking a ball back into play. Statwise for Albany, Wright had 14 kills on the day, no attack errors, and a hitting percentage of .609. Brostrom had 11 kills, Vandegrift had 8 kills and .375 hitting percentage, Prgomet had 5 on the day. Stanley had 34 assists and 4 service aces. Gonzalez had 20 digs on the day. Wright also had 3 blocks on her own and shared 3 blocks. Albany had 10 attack errors on the day, and 5 service errors. For the Hawks, Kami Nethersole had 11 kills and .321 hit percentage. Sareeta Nethersole and Cordell had 8 kills a piece. Tamburri had 27 assists, and Etta had 3 digs though was plenty busy, Cordell led the team with 10 digs on the day. Sareeta Nethersole had the lone solo block of the day, and Tamburri and Cordell each shared 2. Hartford had 19 attack errors, and 3 service errors. Coach MJ Engstrom’s team is now 5-0 in the America East, and 11-7. Don Ferguson’s Hartford quad drops to 1-4 in the AE, and is 10-12. Women’s Volleyball: Hartford and Binghamton go 5 sets.